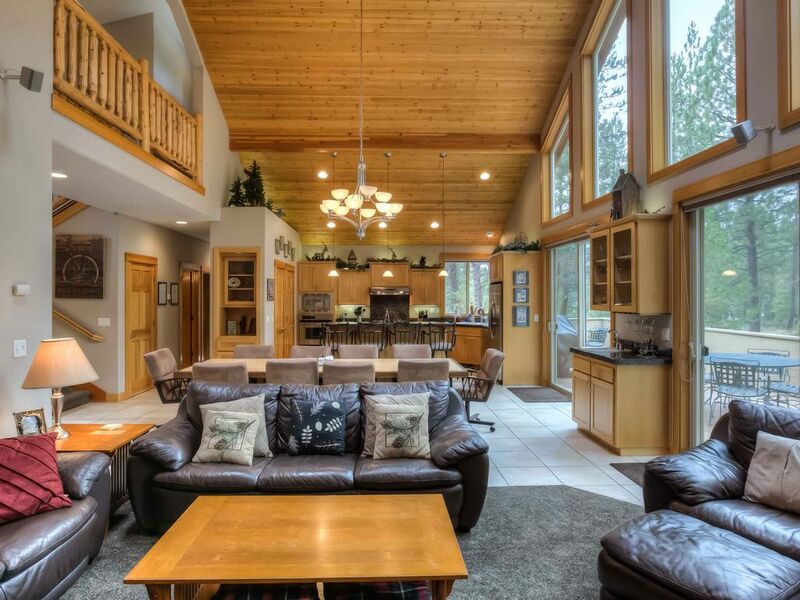 Deerfield Lodge is an amazing 3,300 square foot, 5 Bedroom, 5.5 Bath lodge style, executive vacation home in Sunriver, Oregon. This home boasts 4 King Master Suites and a beautiful additional 5th bedroom + bonus/bunk room! EXCEPTIONAL LOCATION - 5 minute Walk to SHARC recreation center and waterpark! This spacious home features upscale amenities throughout and some recent NEW ADDITIONS, making this the perfect place your next vacation. Relax in this exceptional home where the use of logs, natural wood, granite and slate in a huge, open 'great room' with vaulted hemlock ceilings. This floorplan, with main floor living and 2 master suites on the MAIN LEVEL, creates the perfect vacation environment. There is room for everyone to spread out with 2 separate living areas and a great 3rd car garage with PING PONG TABLE. You will love the 4 MASTER SUITES, with KING BEDS, 5th bedroom/office with Queen Bed, and 4 comfortable twin beds make this home perfect for a large family or a group of couples who all like to have their own room and bathroom. In addition, this home has an exceptional South end location between circles 2 and 3, making it very close to the mall and marina area. When you want an incredible, luxury, vacation rental that will pamper you on your vacation, then Deerfield Lodge is for you! Deerfield Lodge comes with UNLIMITED USE passes to NEW SHARC CENTER which includes indoor and outdoor recreation pools, 15-person outdoor adult hot tub, outdoor lazy river, water slides and tot pool, sand play area, playground, basketball court, bocce ball, indoor/outdoor café, picnic areas, outdoor amphitheater, winter sledding hill, event/meeting rooms, etc. Deposit of 35% due at time of booking reservation. Remainder of balance is due 60 days prior to arrival. PETS/ANIMALS-- Pets or any type of animal are not permitted in the home under any condition, nor on the premises. Anyone caught with animals will be subject to fines. SMOKING—This property is completely non-smoking. Smoking of any kind is not permitted in the home or on the premises. Anyone caught smoking on the premises, will be subject to fines. OCCUPANCY-- Guest(s) agrees that premises shall not be occupied by more than the number of people specified in any 24 hour period. Occupancy limits includes any guests visiting during the day and anyone over 24 months in age (not just those sleeping in the home). If it is found that more than the maximum number of people are occupying the home at any time, guests will be asked to leave without a refund. Information on occupancy limits may be viewed on Blue Pacific’s and Homeaway/VRBO websites. HOUSEKEEPING-- The home will be professionally cleaned prior to arrival and after guest departure. Guests shall leave premises in clean, undamaged condition, similar to the way they found it. The cleaning fee covers laundry, sanitization, and cleaning associated with “normal” use. SATURDAY ARRIVALS/DEPARTURES-- Saturday arrivals or departures may be subject to scheduling approval/review during the off-peak/ski Season in Sunriver. A reservation representative will review the reservation and call you and address the issue if this is a problem. All reservations are pending and subject to review of our staff prior to finalizing. No Pets. Unlimited Passes to NEW SUNRIVER AQUATIC CENTER which includes indoor and outdoor recreation pools, 15-person outdoor adult hot tub, outdoor lazy river, water slides and tot pool, sand play area, playground, basketball court, bocce ball, indoor/outdoor café, picnic areas, outdoor amphitheater, winter sledding hill, event/meeting rooms, etc. Opening May 2012. Sunriver, Oregon is the ultimate get-away for families and groups of friends. In the winter you can ski, snow shoe, take a sled ride, or cozy up by the fire to play some boardgames! In the summer, there is extensive biking and hiking trails, horseback riding, canoeing, the popular SHARC recreation center/waterpark and much more!